A nod to the odd: After reviewing hundreds of quirky collections across the country, here are our seven best! There’s nothing wrong with paying a visit to New York’s wonderful Metropolitan Museum or the LA’s Getty, but what happens when you go home? Try to tell your neighbors about what you saw and you’ll be lucky if you get a suppressed yawn. (Don’t even try to cue up the video!) Want to give your friends something to really talk about? We’ve scanned the country for the weirdest museums possible. After reviewing hundreds of quirky collections, here are our seven best! What: The most fascinating display of historical medical specimens imaginable. The collection is at once serious, comprehensive, and entertainingly gruesome. How it started: The Mutter grew out of an 1850s-era collection of instructional exhibits for doctors. Fun fact: One exhibit contains drawers full objects removed from gagging patients including collar buttons, hair clips, safety pins, diaper tabs, jacks, and skate keys. What: More than 5,300 mustards, plus (wait for it!) tons of mustard-related memorabilia. Fun fact: Shakespeare loved mustard. He mentions it four times in his plays. He never mentions ketchup. Not even once! What: A collection of live and dead critters big enough to make your eyes bug out. How it started: Launched as a publicity stunt to attract more customers to an extermination service, the collection eventually took on a life of its own. Fun fact: The museum is home to “Libe-roachi,” a cockroach dressed as the famously flamboyant piano player. What: More than 20,000 shakers in all. Really! Fun fact: One salt shaker at the museum is made from the ashes of Mount St. Helens and shaped like the volcano. When you pop the top, it resembles the “after” photos. What: If your first thought about most modern art is: “my kid could paint that,” this place is for you. Actually, the guiding principle is: my kid did paint that—then threw it out, then someone rescued it from the trash! How it started: Founder Scott Wilson actually did rescue the first painting from a trash heap one evening to salvage the frame. In a so-bad-it’s-good moment, he held onto the thing. What: The small museum celebrates not just voodoo, but its integral connection to New Orleans. 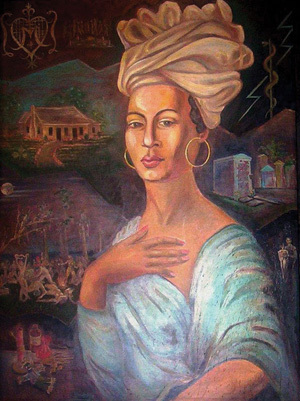 How it started: From a collection of memorabilia associated with Marie Laveau—the matriarch of New Orleans voodoo. Fun fact: Contrary to popular belief, voodoo dolls were never designed to inflict pain on a practitioner’s enemies; they were used for medical record keeping. The color-coded pins let doctors know what previous ailments the patient had and how they were treated. What: A 5,000-square-foot tribute to coin-operated machinery from turn-of-the-century gypsy fortune-teller machines to modern pinball games. How it started: Museum founder Marvin Yagoda began collecting gadgets and gizmos in the 1960s. When a food court was installed in a local mall, he stuck a few of his machines in the back as a novelty. “From there, it just grew and grew and grew,” says Yagoda. Fun fact: The first vending machine, which dispensed holy water, was invented 2,000 years ago.